Part of the challenge of being a single girl is that single girls don't like to share. I suppose we aren't wired the same way as our serially monogamous counterparts who have no qualms about sharing. Compromise? No thanks. Compromising just means nobody gets what they really want. There is a common misconception that girls don't have bowel movements. Contrary to this belief, we do occasionally have to go #2. But because of this ridiculous notion that girls "don't do that," we are irrationally petrified of doing anything resembling a bowel movement except in the privacy of our own bathrooms. (I know some girls who can't even do a #2 in public restrooms. Not even in the super swanky ones like at Neiman Marcus!) This is one of the main reasons why we don't like sleeping over at his house. The first time I ever went on a weekender with a dude, I booked us a suite with two bathrooms. Not having to share a bathroom is more than just knowing the toilet seat is always down (where it should be). I can honestly say without exaggerating that single girls spend at least three hours a day in the bathroom. We spend at least 12% of our time in the bathroom! I know! This may sound nuts, but we have our reasons. And they're all very good reasons. What are we doing in there? I would say maybe 1% of our time is actually spent sitting on the toilet. The remaining time is spent buffing, shaving (in all sorts of nooks and crannies), polishing, moisturizing, soaking, lathering, brushing, moisturizing (under-eye this time), flossing (very important), tweezing, exfoliating, spritzing, waxing, moisturizing (anti-aging cream this time), and of course, examining. The best part of not sharing a bathroom is unadulterated examination of our bodies. Single girls can spend literally HOURS of time looking at ourselves in the mirror. It's not what you may think. We especially like to stare at our pores, look for grey hairs, watch for potential wrinkles, poke at cellulite, pinch the fat on our sides, examine stretch marks and monitor zits. The bathroom is where we can look at our flaws and figure out what to do about them and how to hide them. Single girls are consistently judged more so than our non-single peers. The bathroom is where we like to store things without worrying about prying eyes judging us - not for our preference in condoms, not for being on our period (single girls like to leave a box of tampons out during this "time of month"), not for having three different kinds of foot cream (those 4" stilettos are hard on our feet), and not for our poor eyesight (since contact lens providers like printing our prescription on those darn boxes). Having my own bathroom is glorious. The only bad thing about not having someone yelling at my hair clogging up the drain is that I actually have to unclog my own hair out of the drain. Ick. 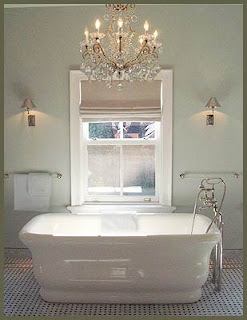 Wouldn't I LOVE to have THAT bathroom all to myself! I loved my single girl bathroom. I say loved because well.... now I have to share. Quelle Horreur!! !